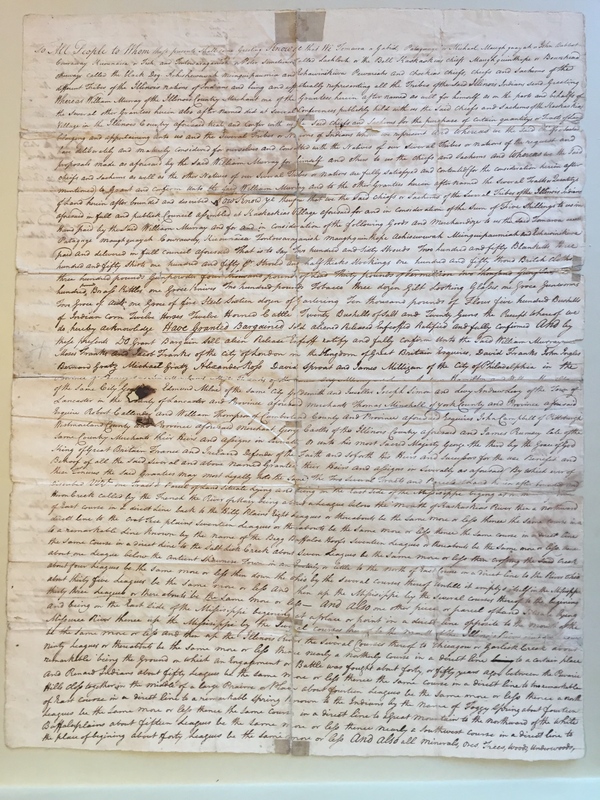 I am writing for help in trying to figure out how to research an old deed that we found in my grandmother's attic, which I feel is a copy of the original deed (or possibly the original?) to the Illinois Company land purchase of 1773 from the Illinois Indians (a collective of multiple tribes from what I can tell). 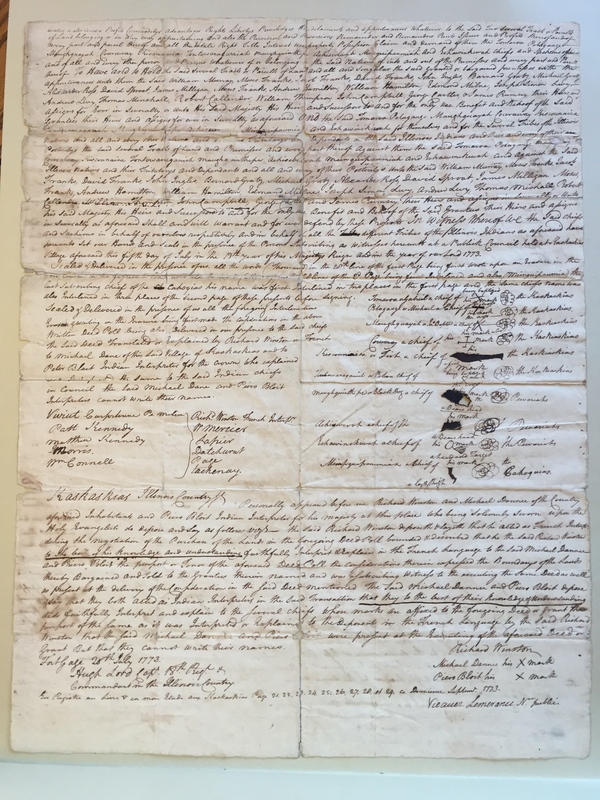 This is a land deed that was involved in a Supreme Court Case of 1823 Johnson v. M'Intosh during which "the Court ruled that the U.S. government, following earlier British precedent, would not recognize private purchases of native lands, and that Illinois-Wabash Company's purchases were therefore invalid" (Wikipedia). When my grandmother passed away, I came into ownership of the deed as the family member most involved in our family history. I believe one of my ancestors is the Thomas Minshall who is mentioned on the front page of the deed, and I believe this physical deed came into our family when a Robert Peel Minshall 'discovered' the deed in a bank in the 1800's based on a newspaper clipping describing that "find". I have been working to figure out the authenticity and historical importance of the deed, and was wondering if anyone here might have any insight or leads. I am wondering if there may have been multiple copies made at or near the original time of signing or if this could be an original, and I'm still trying to figure out how my deed fits into the big picture. I have had it looked at by a local archivist who felt the paper and ink was appropriate to date to the late 1700's. I've attached a couple snapshots of the deed. It measures 15"x20" and the pictures are of the front and back. I would be very interested in any thoughts anyone might have about this document, it's importance, and any other leads for research. Thank you very much for your time and any insight. Thanks for posting your inquiry to the History Hub! What an interesting document! There are many possible avenues of research available to you. One possibility is to review documents from the subsequent Supreme Court case you mention in your inquiry. Case records may be available from the National Archives in Washington, DC. The records, held in Record Group 267, Records of the Supreme Court of the United States are held at the National Archives in downtown Washington, DC. You can find a fuller description of these records here https://www.archives.gov/research/guide-fed-records/groups/267.html. You can contact them via email at archives1reference@nara.gov. Please include your full contact information with your inquiry. In addition to any available Supreme Court records, the fine folks in Washington could suggest, possibly, other potential bodies of records which may be useful in your research. The National Archives at College Park, Maryland's Cartographic Branch may hold records cartographic records relating to the deed. You can send them an inquiry at carto@nara.gov. Again, please include your full contact information. Record Group 49, Records of the Bureau of Land Management, and Record Group 59, General Records of the Department of State include records, many of which have been microfilmed, relating to the Territory Northwest of the River Ohio dating from approximately 1787. These microfilm publications are available at the National Archives in Washington, DC and also many of our regional archives. You can find descriptive pamphlets that provide further information about the records by searching the National Archives microfilm catalog here https://eservices.archives.gov/orderonline/start.swe?SWECmd=GotoView&SWEScreen=GPEA+Microfilm+MIF&SWEView=GPEA+Microfilm+Landing+Page+View+MIF. The microfilm publication numbers to search for include M470, M477, M478, and M479. The respective links will take you to web pages that provide the descriptive pamphlets under the heading "View important Publication Details." The Papers of the Continental Congress, 1774-1789, which have been digitized, also includes references to the Illinois-Wabash Company. Unfortunately, we’re unsure whether these relate specifically to the deed in your possession, or other land claims or subjects. You can access the digitized records through Fold3, a subscription-based site. Your local library may provide courtesy access to Fold3. Depending on where you live, the various National Archives facilities around the country can provide complimentary access, too. We always suggest calling first before you visit. You can find Fold3 here https://www.fold3.com/. Outside of the National Archives another possibility for further research is the Draper Manuscript Collection at the Wisconsin Historical Society in Madison. The Draper Collection is considered one of the foremost research collections on the Northwest Territory and Ohio River Valley. The collection is quite extensive. There is a published guide to the collection which can be obtained through interlibrary loan through your local library. You can find more about the collection here https://www.wisconsinhistory.org/Records/Article/CS4103. The American State Papers, a massive collection of published early documents relating to the United States, is yet another possibility for potential research. You can find digitized copies of these records via the Library of Congress here https://memory.loc.gov/ammem/amlaw/lwsplink.html#anchor9. The Abraham Lincoln Presidential Library and Museum in Springfield, IL, may be another avenue of research. Their holdings may include records or publications of interest: http://lincolnlibraryandmuseum.com/lincoln-library.htm. We noticed that the bottom of the Wikipedia entry for the Illinois-Wabash Company also cited some worthwhile books and articles which may be useful for either their content or citations: https://en.wikipedia.org/wiki/Illinois-Wabash_Company. In terms of determining whether the document is original or authentic we would suggest that you contact a reputable dealer in antique documents. Unfortunately, the National Archives cannot provide such a service. While we are unable to make recommendations for a dealer, you can easily locate several via a Google search. We hope this information provides you with some further ideas for research on such an interesting document! Thanks for the suggestions and the various links to follow up. Working through these should keep me busy for quite a while!